Use of scooters as a means of transportation. There were even racks throughout each floor for Google employees to park their scooter. Lego wall in a lounge area. The wall was lined with bins of different sized and colored Lego's. It was clear that employees are encouraged to unleash their creativity when it suites them. The Angry Birds and super-sized Ferris wheel designs were extremely impressive. Specialized areas/rooms: A few that I noticed were the gaming and massage rooms. Mini-kitchens galore. It was obvious that appetite contentment is a priority at Google. Some of these kitchens were decorated in particular themes. One of the most elaborate mini-kitchens I saw was decorated as a jungle complete with hammock-like chairs, small waterfalls, decorated trees, and live frogs. It was so relaxing that I could easily see myself napping in there from time to time. Equally impressive were the massive espresso, cappuccino, and coffee machines in each kitchen as well as the overwhelming selection of food and beverages. 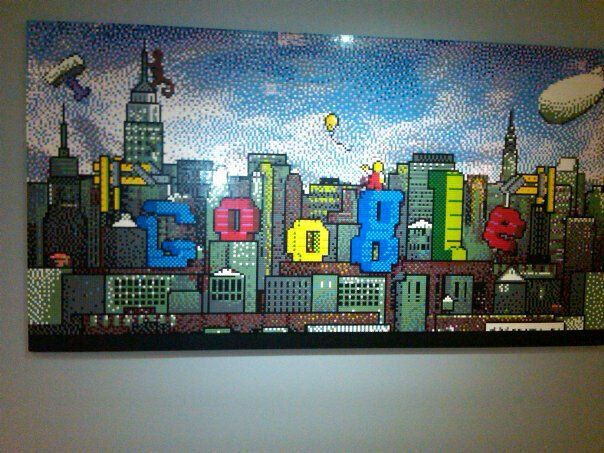 Google-themed artwork throughout the building. Company pride was apparent everywhere. Clever reminders not to do certain things. One sign throughout the building was a picture of an alligator with it's tail propping the door open. Each picture was accompanied with this reminder, "Beware the Tailgator!" Obviously Google didn't want some doors propped open for security reasons. Office spaces where entire walls were whiteboards, perfect for brainstorming and outlining creative ideas. These offices had a large table that could seat approximately 12-16 people. Open spaces with collaborative and comfortable furniture (leather couches, plush lounge chairs, etc.) not to mention more coffee stations. Bistro dinning area that provided employees with an unparalleled lunch. This place was not even normal. Lunch was truly a dining experience here and I was in awe of the immense selection of choices. I couldn't believe that fresh sushi was available. The chef preparing a special of the day was a nice touch as well. The atmosphere described above along with Google's 80/20 Innovation Model really inspires and motivates employees to perform at a consistently high level. Who wouldn't want to work here in this type of environment? Now imagine if schools adopted a similar thought process and designed learning as well as common spaces using several of the principles described above? It gives me chills thinking about the potential this could have on increasing achievement, motivation, and developing a passion for the learning process. School would become a place where students couldn't wait to get to and at the end of the day would be reluctant to leave. School re-design needs to become part of the education reform conversation. Is my thinking that far-fetched? What would your perfect school environment include? Development: As educators we must always model life-long learning for our students and continually pursue avenues for growth. I remember during my time at the Google Academy for Administrators hearing the term "lead learner" for the very first time. How can we expect our students to embrace this concept if we do not? In addition to a District PLC initiative, my administrative team and I worked over the summer to reduce non-instructional duties so that the majority of the staff would have time embedded into the day to pursue a variety of growth opportunities, including those associated with a Personal Learning Network (PLN). You can read more about this initiative HERE. Energy: "To teach is to touch a life forever" - Anonymous As educators we must exhibit a passion for what we do because each day we have the opportunity to positively impact the life of a child. It's our energy and passion that convey to students that learning is fun, possible, and important. If we lack the energy to instruct each and every learner to the best of our ability day in and day out we might possibly lose one of the most precious gifts in our profession.....helping all of our students accomplish and exceed their goals. Solutions: Change, increasing student achievement, and getting better is hard work. Educators must diligently strive to eliminate the excuses, collaborate, and respect one another. With this in mind, a culture will be established that seeks to find solutions as opposed to focusing on just problems. Innovation: Abiding by the status quo is not an option. We must continually reflect upon our pedagogical techniques to cover the curriculum in a way that enables our students to develop critical thinking skills, foster problem solving techniques, work collaboratively, build technological/media fluencies, and make interdisciplinary connections. Innovation also requires us to integrate 21st Century tools into our instruction, take calculated risks, and relinquish control at times. Resolve: "His resolve is not to seem, but to be the best" - Aeschylus It is imperative that we continuously exhibit resolve in our quest to provide our students with essential skills to be successful in college or the workforce. A collective mindset on becoming and being the best educator possible must always be our goal. Environment: Learning environments must be transformed in a way that best meets the needs of our learners. They should be student-centered, integrate technology, flexible, allow for creativity, support higher-order thinking, and celebrate student accomplishments. I even discussed the push to move away from traditional seating arrangements in order to promote collaboration. go above and beyond to ensure that all students succeed? collaborate with peers, share resources, and be pillars of support when needed? take calculated risks without the fear of failure? share student and personal accomplishments? create a student-centered, rigorous, and relevant learning environment? extend yourself outside of the classroom and in the community? If so then it is time to put these desires into action! Best of luck to all of you in your quest to bring out the best in your students and put them on a path to exceed their goals. Note: All teachers received this acronym on poster board for display in their classrooms. It has also been placed on the walls in offices. I am across this video recently and wish I had it for my opening day with teachers. It is definitely a discussion starter in regards to what should be occurring in the classroom, our respective roles in the profession, and how we should be working with our students to unleash their potential. Is there more that can be added to this discussion?